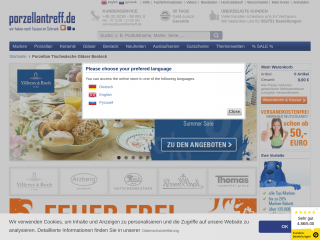 Porzellantreff is a German on-line shop of porcelain, glass, ceramic tableware and cutlery of the leading European brands such as Villeroy & Boch, Rosenthal, Rosenthal Versace, Wedgwood, Le Creuset and many more. Established in 1999 by the German company Steinkamp KG Porzellanhandel, the on-line shop Porzellantreff.de was among the first ones to sale crockery on-line. Currently we account for more than 360.000 customers in Germany and around the globe. Porzellantreff.de puts a great stress not only on a high quality of the products on offer but also on the excellent customer service. -the product range which includes more than 1500 lines and designs of crockery by various leading manufacturers. - fixed freight costs irrespective of the order value or weight.